This month, many shorebirds are nesting in the high northern latitudes. 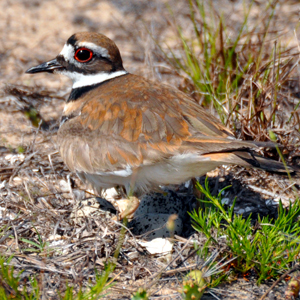 A few species, such as Killdeer and Piping Plovers, nest in the Continental United States, but most are in northern Canada and Alaska, nesting on the tundra. dynamic group of birds because they are difficult to identify. To a new birder, shorebirds all look pretty much alike. But a few easy tips will help you sort them into groups. Once you can narrow down which group of shorebirds your mystery bird belongs to, identification becomes much easier. juicy invertebrate. This behavior is easy to identify. 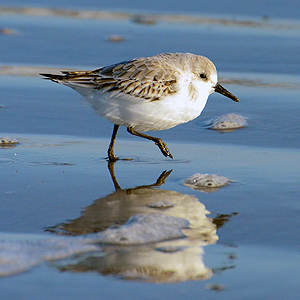 Look for sandpipers (and most other shorebirds) in open mudflats or sandy beaches. 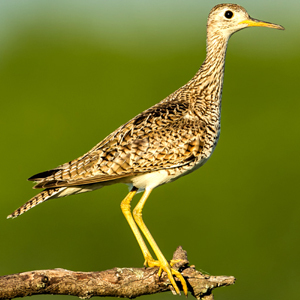 Some, like this Upland Sandpiper, prefer grasslands and eat insects. Just think of peeps as mini sandpipers. They are very small, about the size of a sparrow (and include the Sanderling above). Like other sandpipers, peeps also feel for food with their bills, although they are much shorter. They have short legs, and when they run, their little legs move so fast they look like a blur. distinct way of feeding.They stand upright and scan the area until they spot a yummy invertebrate, then quickly run towards it and grab it. Then they stand still and scan again. This is very different behavior from sandpipers or peeps. Take a look at this Killdeer and notice the difference in the beak shape from the sandpiper, and the length of the legs. Once you spot a shorebird, determine whether it is a sandpiper, a peep or a plover. Categorizing shorebirds into these groups will greatly help you narrow down the species. Once you can determine the type of shorebird it is, to get the exact species look at things such a shape of beak, color of beak, size of bird compared to other shorebirds, color of legs, etc. After the initial sorting into types, making a precise ID requires a lot of practice, as some of the differences between species can be pretty subtle. Shorebirds can often be identified by behavior and vocalizations, and you can learn these just by watching them. Shorebirds are fun to watch, and identification will become easier as you get more experience. So, get to the beach and practice, practice, practice those ID’s!